On November 11th, the much-anticipated iPad Pro became available to purchase simultaneously in Apple Apple’s online and physical stores. Are you ready for it? If you are still unsure as to whether you want an iPad Pro, here the article would tell you some important things you need to know before buying one. The iPad Pro is a much bigger device than the average tablet user will be used to - obviously, with a 12.9-inch display, which is designed to straddle the gap between laptop and tablet. It brings a massive screen, “desktop-level” power, and accessories like a keyboard and Apple pencil that allow new ways of interaction. View the following picture to find more specifications of iPad Pro. What about colors of iPad Pro? The iPad Pro will come in the same silver, gold, and space grey as its predecessors. What's new in iPad Pro? Bigger display: The iPad Pro brings a 12.9-inch massive Retina display. New A9X processor: At the heart of iPad Pro lies the new A9X, which delivers up to 1.8 times the CPU performance and double the graphics performance of previous A8X. Four speaker audio: iPad Pro creates an audio experience as big as its display with four new high-fidelity speakers built directly into its unibody. New accessories: Apple Pencil and Smart Keyboard: The big changes to the iPad Pro come with the accessories. Apple launched two new accessories, the Smart keyboard and the Apple Pencil. For many people, a keyboard makes it more convenient to get things done or write thought down. 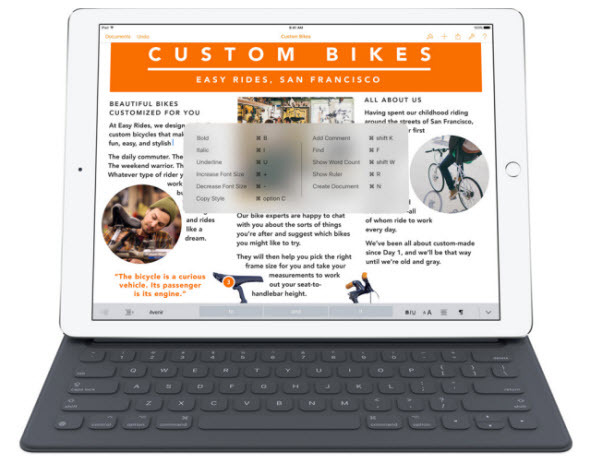 The new Smart Keyboard of iPad Pro completely reimagines this centuries-old invention and adds even more flexibility. It is easy to use and powered in a brand new way. The keys are covered in a fabric material that's easy to wipe clean. And it offers the same shortcuts found on the Mac keyboard. What’s more it uses the new Smart Connector which lets you magnetically attach cases and sends data and power through them. But, better products always cost more, you need cost $169 to get one. The Apple Pencil is the company’s first stylus for iOS. It has several sensors on both its case and the tip that can detect the position, pressure, angle, and orientation of your strokes, which makes it just like a real pencil. The Pencil pairs via Bluetooth, and also needs charging: a lightning plug on the end lets you plug it into the Pro for a quick charge. Fully charged, the Apple Pencil would last for 12 hours. By the way, it costs $99. iPad Pro is highly reviews as one of the most brilliant tablets by many experts. However, whether to buy it or not is all up to you. The key thing here is how happy you are with the new iPad Pro. To anyone that wants an iPad with more power, a better media and reading experience and more abilities than ever before, there's no question here. Go for the iPad Pro and you'll love it. iPad Pro is the perfect travel companion for it can not only handle your work, but also it can bring more entertainment options. The 12.9-inch display is perfect to watch movies and TV shows during boring flight. iTunes Store, as one of the largest HD TV shows and movies provider, offers thousands of Movies and TV shows for downloading. We all know that, iTunes rentals have many restrictions for the DRM protection. iTunes rentals can only exists in iTunes for 30 days after downloading. Even, you need finishing watching the rental within 24 hours once you start watching, which brings many inconvenience to iTunes users. To unlock the 24-hour limitation of iTunes rentals and keep the videos forever on your iPad Pro, you need to remove DRM first. NoteBurner M4V Converter Plus For Mac, a professional iTunes video converter which can help you remove DRM protection form iTunes purchases and rentals and convert iTunes movies and TV shows losslessly to various video formats with 20X faster speed. If you are running Windows OS, there is also NoteBurner M4V Converter Plus for Windows available. Download and install NoteBurner M4V Converter Plus on your Windows or Mac to have a try. After removing DRM from iTunes videos, you can keep iTunes rentals forever. NoteBurner would offer 1 minute for free trial. To unlock the time limitation, buy the full version with $44.95 ($69.95).